Possible New World Record for Lowest Barometric Pressure: 860 mb? Above: VIIRS infrared (I-5) image of Typhoon Haiyan, taken at 1639 UTC on November 6, 2013, a little more than a day before it struck Samar Island. Image credit: Courtesy Dan Lindsey (NOAA), via VIIRS Imagery and Visualization Team Blog. 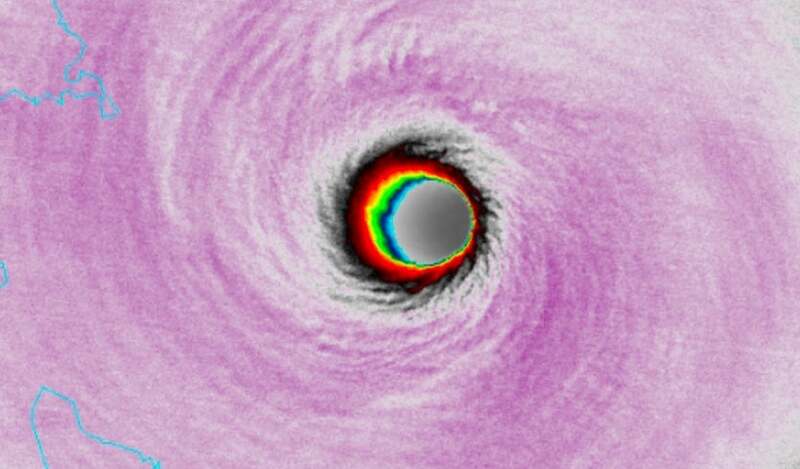 A study published in October in the journal Weather (British Royal Meteorological Society) has proposed that the central pressure of Super Typhoon Haiyan, which ravaged the Philippines in November 2013, fell to 860 mb (25.40”) on November 7, when the storm attained its peak intensity just prior to making landfall on Samar Island. If true, this would establish a new world record for lowest sea-level pressure yet observed or estimated on Earth’s surface, surpassing the currently accepted figure of 870 mb (25.69”) attributed to Typhoon Tip on October 12, 1979. Below is a table of all the tropical cyclones that have estimated or measured central pressures of 885 mb or lower. It is likely that there were other such extreme events, especially in the West Pacific Basin, prior to regular remote monitoring of tropical cyclones. This monitoring includes aerial reconnaissance that began in the Pacific and Atlantic in the late 1940s, and satellite observations that began in the late 1960s. Figure 1. Lowest observed and measured barometric pressures at sea level during tropical cyclones worldwide since 1950. Sources: JTWC (Joint Typhoon Warning Center), JMA (Japan Meteorological Agency), NHC (National Hurricane Center). 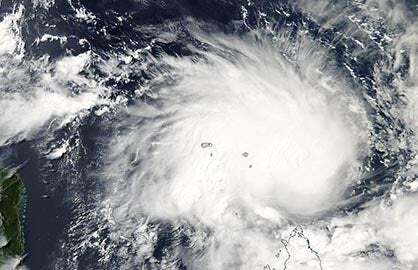 Note: Super Cyclone Monica had an estimated central pressure of 879 mb on April 23, 2006 in the Gulf of Carpentaria, Australia according to a post-storm analysis by the Joint Typhoon Warning Center. However, the Australian Bureau of Meteorology (BOM) has officially designated a minimum pressure of 915 mb to the storm. Note that the Japan Meteorological Agency and the Joint Typhoon Warning Center do not always agree to the same figures so far as minimum pressure or maximum wind speeds attained during tropical cyclones in the West Pacific. For instance, Typhoon Mike (at the bottom of the list above) had a minimum pressure of 885 mb according to the JTWC, but only 915 mb by the JMA. Figure 2. The eye of Super Typhoon Forrest as photographed from the window of a typhoon reconnaissance aircraft over the West Pacific in September 1983. 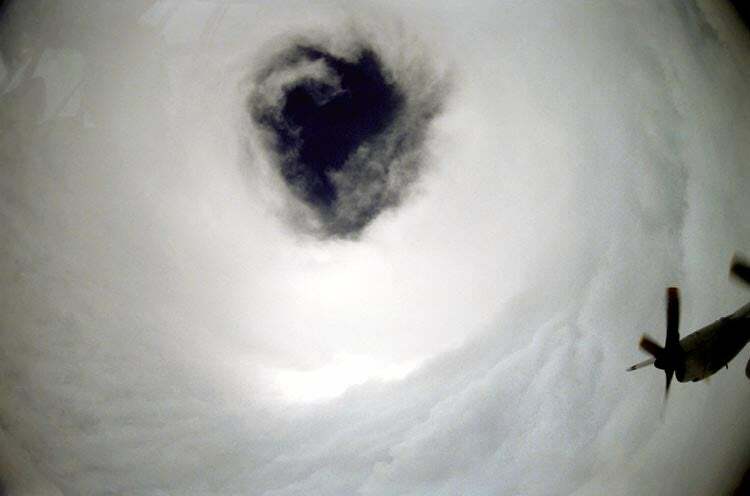 This image is looking up into a pinhole eyewall structure whose diameter at the time was about 6 km (4 mi). The lowest measured central pressure in Forrest was 876mb (25.86”), the fourth lowest ever measured or estimated during any tropical storm on Earth. The storm also holds the world record for the fastest intensification observed in a tropical cyclone over a 24-hour period: a pressure fall of 100 mb, from 976 mb to 876 mb (28.82” to 25.87”) on September 22-23. 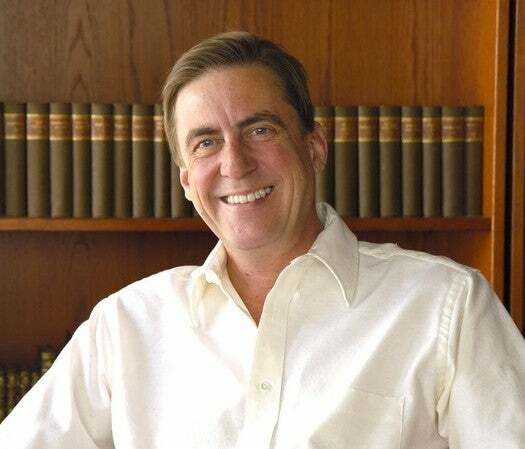 Photo courtesy of Scott A. Dommin. 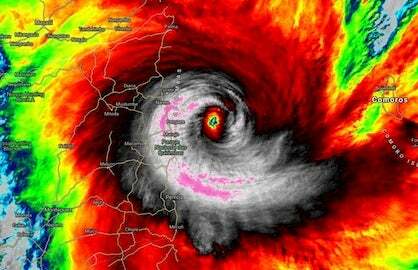 Did Typhoon Haiyan have a new record-minimum pressure? Above is the title of the report recently published in Weather and authored by climate scientists Karl Hoarau, Mark Lander, Rosalina De Guzman, Chip Guard, and Rose Barba. Using data from Guiuan on Samar Island—the only weather station that came close to the eye of Haiyan at the time the storm was at its peak intensity—the authors compared Haiyan to two other powerful tropical cyclones where actual measurements of barometric pressure were made rather than just estimates of such. These two storms were Hurricane Patricia (see table above) and Super Typhoon Megi, which was part of a special study of the impacts of typhoons on the Pacific Ocean in 2010. Both storms were closely monitored by aerial reconnaissance. Routine aerial reconnaissance of Western Pacific typhoons ceased in 1987, and since then a variety of different methods have been employed to estimate the intensity of Western Pacific tropical cyclones. The method used since 2009, and that which was employed to measure Haiyan’s intensity, hinges on satellite-based pressure-wind relationships analyzed by John Knaff and Ray Zehr (NOAA/Colorado State University/CIRA) and Joe Courtney (Australian Bureau of Meteorology). For more background on the Knaff-Zehr-Courtney technique and wind-pressure relationships, see this presentation from the three researchers and this 2014 conference presentation. 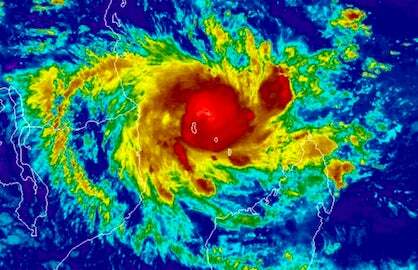 Of the many different types of satellite imagery, the one that storm scientists have found best measures a storm’s intensity is the infrared Dvorak image. The variations in temperature that appear in a Dvorak image across the very cold cloud tops and warm eye of a tropical cyclone are calibrated to support the Dvorak technique of storm intensity classification (see this explanation of the technique). The JTWC and the JMA concluded that the minimum pressure of Typhoon Haiyan was 895 mb using the pressure-wind relationship method. However, a post-storm analysis of the storm’s Dvorak imagery concluded in 2016 that the pressure was 878 mb. In the Weather article, the authors based their conclusion of an 860-mb minimum pressure by comparing pressure gradients actually measured across the eyewalls of Patricia and Megi to that of Typhoon Haiyan, based upon the 910-mb measurement observed at the Guiuan site when the eye of Haiyan was still 28 km away. The storm destroyed the station just after this final measurement was made at 2100 GMT on November 7. Figure 3. 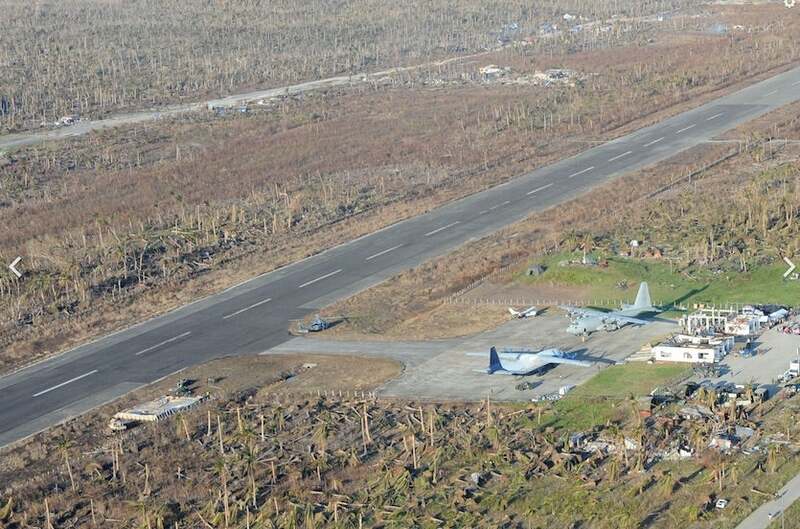 Devastation at the airport serving the town of Guiuan on Samar Island in the Philippines on November 17, 2013, following the passage of Super Typhoon Haiyan on November 7. This airport may have been the site where a pressure measurement of 910 mb was made before the weather station was destroyed. At the time of the measurement Haiyan’s eye was still some 18 miles (28 km) away. Image credit: defenseimagery.mi via Wikipedia. The pressure gradients across the eyewalls of Patricia and Megi were around 4 mb per km at similar distances from the center of their respective eyes, but increased steeply the closer to the eye they came. Some typhoons have much steeper pressure gradients than others, as was the case of Patricia and Megi. Patricia was a small and intense hurricane with an extraordinarily steep pressure gradient of 8.2 mb per km from the center of the eye to a position just 9 km away. Megi, on the other hand, was a large typhoon, and its pressure gradient was about half that of Patricia’s from a similar distance (Megi’s measured minimum pressure was 890 mb versus Patricia’s 872 mb). The authors surmised that Megi was a closer approximation to Haiyan given the storm’s size and thus had a pressure gradient closer to that of Megi than Patricia, though probably not even quite as steep as that of Megi’s since Haiyan and its eye were larger then Megi’s. The authors used three possible scenarios to determine Haiyan’s minimum central pressure based upon the time of the 910 mb measurement from Guiuan when the eye was 28km distant. One scenario employed an average gradient of 3.5 mb/km, another 4.0 mb/km, and another 4.5 mb/km. In the low-gradient scenario, the central pressure of Haiyan was estimated at 866.5 mb; the median scenario resulted in an 861-mb central pressure, and the steep gradient scenario an 855.5-mb central pressure. The authors settled on the 861-mb figure, rounded off to 860 mb. As for the wind-pressure relationship, Patricia officially holds the record for the strongest winds attributed to a tropical cyclone with 185 knots (213 mph) sustained at its peak strength (central pressure 872 mb). This compares to Typhoon Tip’s 165 kts (190 mph) with 870 mb, and Haiyan’s 170 ktd (195 mph) with a minimum ‘official’ pressure of 895 mb. From these facts alone, we may surmise that the pressure of Haiyan was almost certainly lower than 895 mb, since we know Haiyan was a large typhoon. Using the Dvorak technique, Haiyan was a perfect 8.0 (on a scale of 1 to 8). That being said, several other tropical cyclones have attained that exalted status aside from Haiyan, Tip, and Patricia. Figure 4. 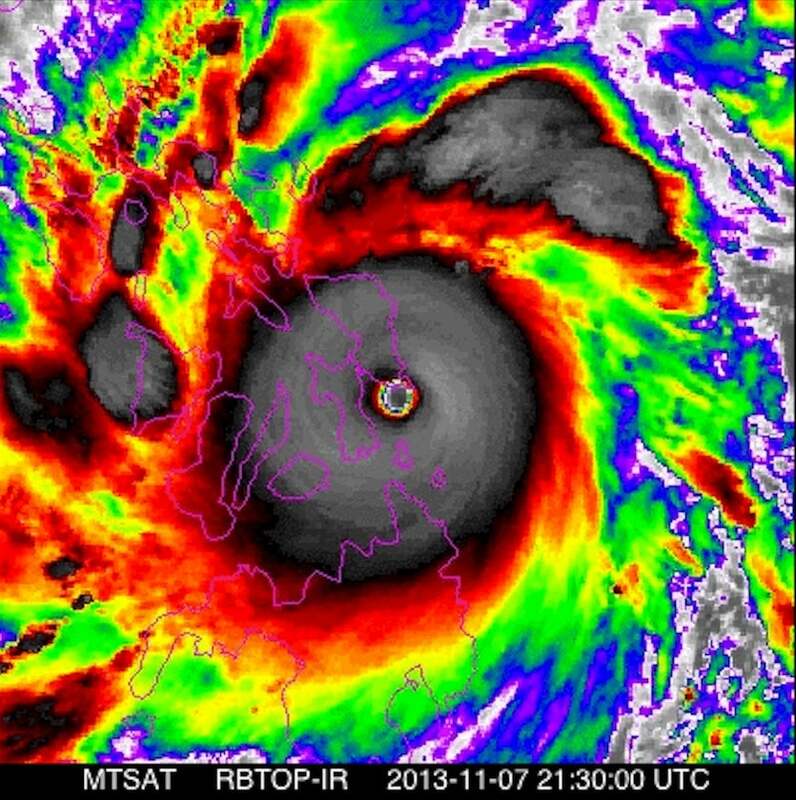 An enhanced infrared (rainbow) satellite image of Typhoon Haiyan just as it made landfall on Samar Island at 21:30 GMT on November 7, 2013. This was 30 minutes after observers at the weather station at Guiuan made their last observation prior to the station’s destruction. Image credit: Japan Meteorological Agency, via Wikipedia. Would the WMO accept this estimate? The World Meteorological Organization’s Global Weather and Climate Extremes Archive includes global pressure records in its database and lists the pressure observed during Typhoon Tip as the official lowest sea-level pressure yet measured on the planet (870 mb). The problem is that because aerial reconnaissance ceased in 1987 in the Western Pacific, the lowest pressure attained in typhoons is virtually always simply an estimate rather than an actual measurement. 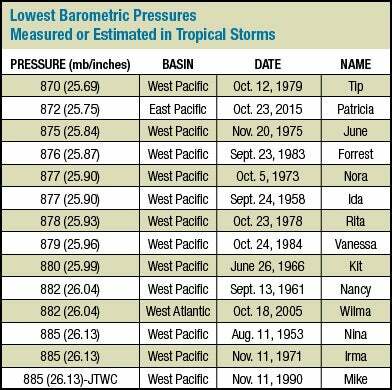 If one looks at the table at the top of this blog, you see that all the lowest pressure records for the Western Pacific occurred prior to 1987 (with the possible exception of Typhoon Mike). Obviously typhoons have not suddenly become weaker (so far as pressure is concerned) since 1987. So perhaps the methods of estimating minimum pressure on a routine basis over the past 30 years are off the mark. Whether or not the WMO would accept ‘estimates’ rather than actual measurements of barometric pressure is an open question. If they do not, then there is virtually no chance that Typhoon Tip’s record will ever be beaten (unless the JMA and JTWC change their methods of evaluating such). Typhoon Haiyan is a rare case when the storm reached its maximum intensity just prior to landfall, and thus we have an actual measurement—the 910mb at Guiuan—to work with. Perhaps the WMO will launch its own investigation into whether or not Haiyan should hold the new record for lowest barometric pressure yet observed on Earth. The full analysis by Hoarau et al., "Did Typhoon Haiyan have a new record-minimum pressure?" is online (behind a paywall) at the journal Weather.